Star Messenger is a multi protocol instant messenger client designed to be efficient and easy to use. 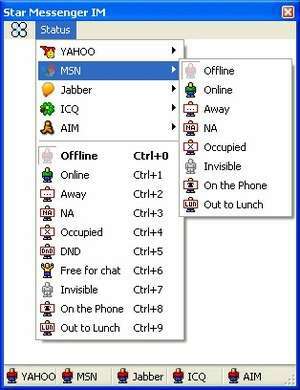 It does not consume your PC resources and features connections to Yahoo, MSN, ICQ, AIM and Jabber so you can be connected with all your friends no matter on what messaging network they are using. Setup is very easy and takes only 1 minute to be online. To begin using the program at full capacity, it only takes two minutes for installation and configuration. For security reasons, you should also check out the Star Messenger download at LO4D.com which includes virus and malware tests. Additional screenshots of this application download may be available, too.